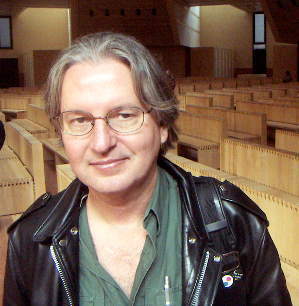 Michael Bruce Sterling (born April 14, 1954) is an American Science Fiction writer. He and his friend William Gibson are the two names most strongly associated with the Cyberpunk movement. Sterling more-or-less put cyberpunk on the map when he released the seminal collection, Mirrorshades: A Cyberpunk Anthology, featuring a variety of new writers. He was one of the most active promoters of the new genre. He was also one of the founders of the Turkey City Writers Workshop, which gave us the Turkey City Lexicon. He was also the first to use the term "Slipstream" in the sense that this Wiki uses it. His breakout novel was Schismatrix; his third. He followed that up with the Campbell-award-winning Islands in the Net. He collaborated with William Gibson on The Difference Engine, and has written over half a dozen other novels and many short stories. Badass Bookworm: Derek Vandaveer of The Zenith Angle is primarily a computer science geek specialising in networks, but well able to handle himself in a fight and undertake illegal black ops. Part way through the book he spends a lot of time working out his frustrations on an exercise machine, so maybe he's taken a level in badass, but there is a strong implication that the underlying attitude was there all along. The Computer Is Your Friend: Subverted in the short story "Maneki Neko", where the Japanese combination of gift economy and social networking on a large scale, backed by enormous (and anonymous) network support, appeared not only wholly benevolent, but also much more convenient, friendly and efficient than your garden variety cyberpunk Mega-Corp capitalism exemplified by the US agents. In short, in this world the computer is indeed your friend, although this system was not without its problems, some of which were explored in its Spiritual Sequel of sorts, Bicycle Repairman. Cyberpunk with a Chance of Rain: Heavy Weather (1994) turns this trope Up to Eleven, as climate change has increased the violence and unpredictability of global weather patterns to such an extent that "Tornado Alley" in the Great Plains has been rendered nearly uninhabitable. Everyone Calls Him "Barkeep": In Zeitgeist, the members of the international girl-group G7 are uniformly referred to as "the [nationality] One". This is not only done when referring to them indirectly ("The French One is my favorite. She can almost carry a tune. "), but even when addressing them directly. ("What seems to be the problem, American One?") This helps remind them (and everyone else) that they're all quite replaceable, and, in fact, several get replaced during the course of the book. Fictional Document: The short story "Our Neural Chernobyl" was written as a review of a fictional monograph (a non-fiction book on a specific real-world topic) about the "neural Chernobyl," which described the development, release, and consequences of a retrovirus that caused massive growth in brain complexity in almost all mammals, something catastrophic for humans as the process makes humans massively intelligent, but effectively burns out the brain after a while. The story even touches on the book's exploration of the controversial topic of non-human uplifting from the virus, where many animals became much more intelligent, to the point cats developed torture devices to use on mice. Fighting with Chucks: In The Artificial Kid, the eponymous protagonist uses a set of nunchaku in his televised battles that included a holdout pistol in the base of each stick. Hopping Machine: In the opening of Heavy Weather, the heroine rescues her brother using one of these. Later, that brother has some drugs and other items smuggled across the border to him using a one-legged hopping robot carrier. Language of Love: The short story "In Paradise" puts a twist on this—the lovers can communicate, but only through the automatic translator on the woman's high-tech phone ("It's from Finland.") This limits the time they can talk, but not the time they spend together. Large and in Charge: Jerry, the leader of the Storm Troupers in Heavy Weather, is a bodybuilder. He thinks that if he's physically larger than the others, they will be more likely to just do what he says and not waste his time by asking for explanations. The Little Shop That Wasn't There Yesterday: This and several other tropes are subverted in "The Little Magic Shop". In the early 19th Century, a young man stumbles on a little shop in New York. The proprietor, Mr. O'Beronne, presses on him several magic items, finally persuading him to buy a bottle of youth potion in exchange for all he possesses. "Really? How much for two bottles?" They strike a bargain: Whenever the man comes back he can buy another bottle on the same terms. This doubly frustrates the shop owner: He has to stay put and keep his shop in business (changing it with the times), and his customer stubbornly refuses to learn the obvious Aesop about the futility of unnaturally prolonged life. Despite all this there is a happy ending for both. Magic Realism: Zeitgeist, set in the midst of Y2K hysteria and featuring one "Leggy" Starlitz and his rather odd daughter. Maneki Neko: The MacGuffin in his story story "Maneki Neko", unsurprisingly. Merchandise-Driven: An in-universe example: in Zeitgeist, the girl-band G-7 was created by Leggy Starlitz primarily to sell The Merch. The music is only of secondary interest to him. Meta Guy: Leggy Starlitz in Zeitgeist is so genre savvy he uses narrative to change reality. The antagonist Greek Mafiya, Mehmet Ozbey, discovers this power, and goes on to use Bond-style Action Hero tropes for his own nefarious purposes. Leggy's young daughter Zenobia is particularly adept. At one point she's dancing on the ceiling, saying "Look Dad! I'm being impossible!" My Skull Runneth Over: The short story "Our Neural Chernobyl" is written as a review of a monograph studying the social and cultural effects on the world after an engineered virus is released that causes rampant dendritic growth - essentially, making people's brains extremely plastic and adaptive so they can constantly learn and think at faster and faster rates. It also frequently causes lethal burnout, nicknamed "chernobyling" after the Chernobyl power plant disaster in the '80s. Eventually, the virus even jumps species, with some animals showing signs of increased yet distinctly inhuman intellect. New Media Are Evil: "The Hacker Crackdown" goes into great detail about turn-of-the-century anxieties about what the telephone meant for society, and draws a parallel with the early online networks. Sand Is Water: His first novel, Involution Ocean, relies heavily on this trope. Zeerust: the glove-and-goggles Virtual Reality rigs in Heavy Weather (1994). Younger readers may not remember the moment when this was going to be the future of computing.